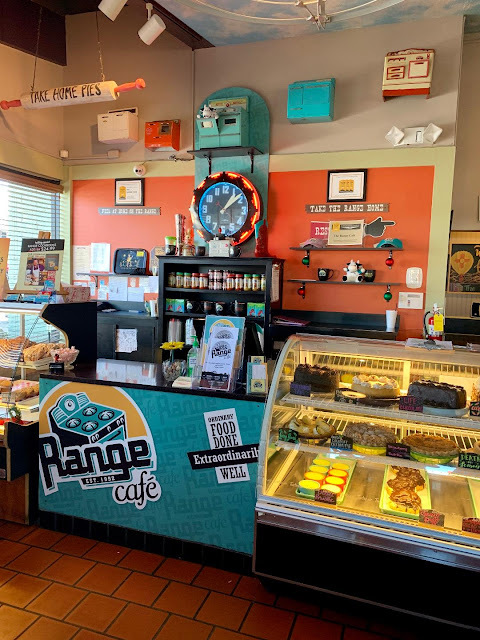 Our friends Marlaina and MacG have told us about a restaurant in Albuquerque, not far from the TA truck stop, that we had to try if we had the chance. Well, this week we had the chance. The Range Cafe is located about a half mile from the truck stop, and after my Olympic training in Europe, walking there was as easy as breathing. Seriously, it's not far. If you're in a big rig or an RV, there's no parking there, so stay at the truck stop and use your legs. 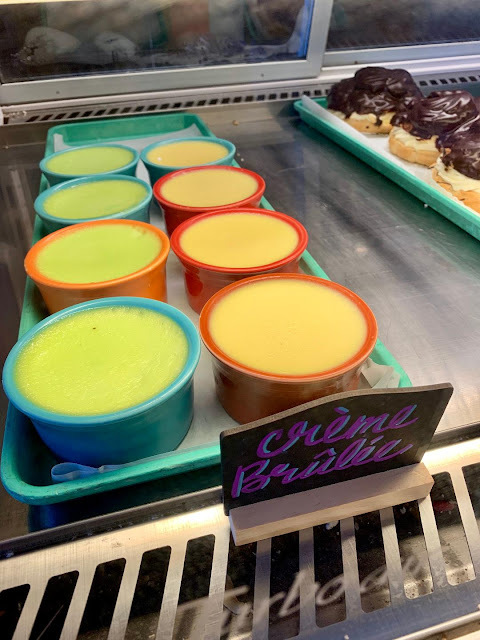 The first thing you see when you walk in is the dessert display case. What a great way to start thinking about what you're going to eat. 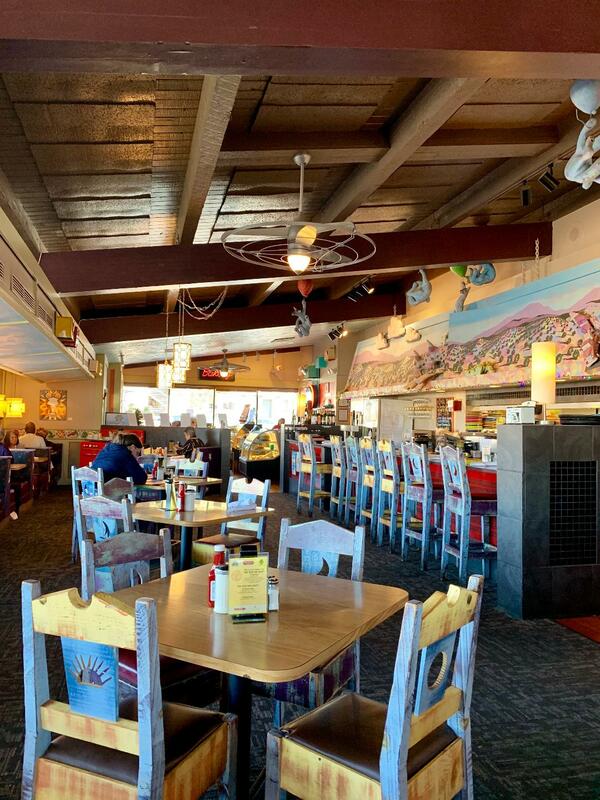 The restaurant, which was clearly repurposed, has a Denny's/Shari's/Howard Johnson's kind of building design but it decorated in kitschy retro contemporary Southwest style. Is that even a thing? 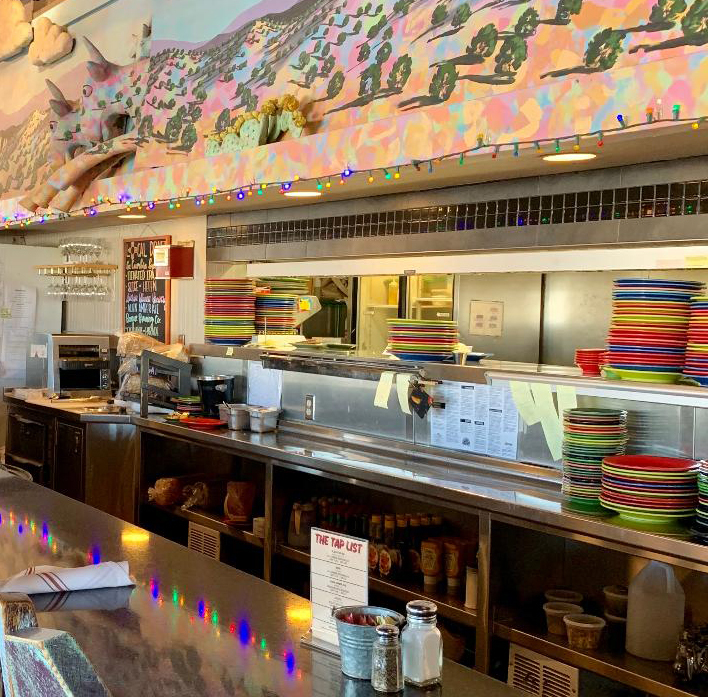 Very Southwestern colors, sturdy wooden chairs with cutouts, muted pinks and blues in a three-dimensional wall mural that hangs above the kitchen pass-through window, and bright Fiestaware plates stacked on the counter. 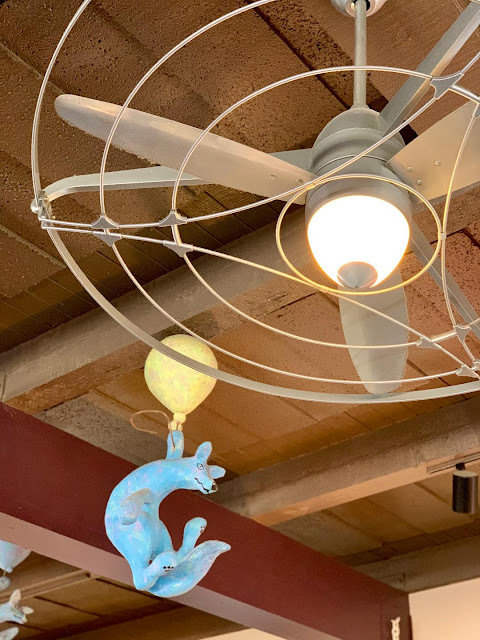 And then other elements, like vintage-inspired little toy stoves (or what people used to call ranges, which is where the restaurant name comes from) placed throughout the restaurant, coyotes floating on balloons, and these cool ceiling fans. 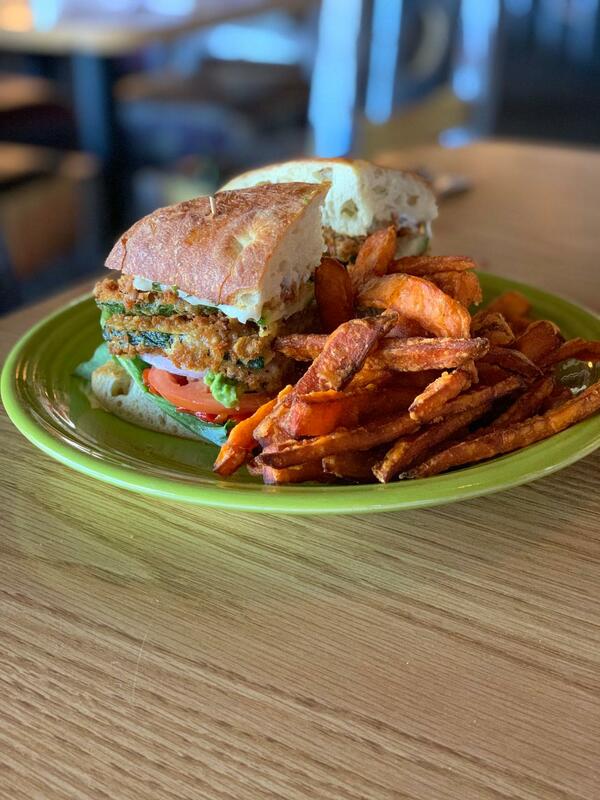 They have an extensive menu with everything from soups and salads, burgers and sandwiches, to Southwestern/Mexican dishes. They have featured plates, too, which add a twist to the familiar. 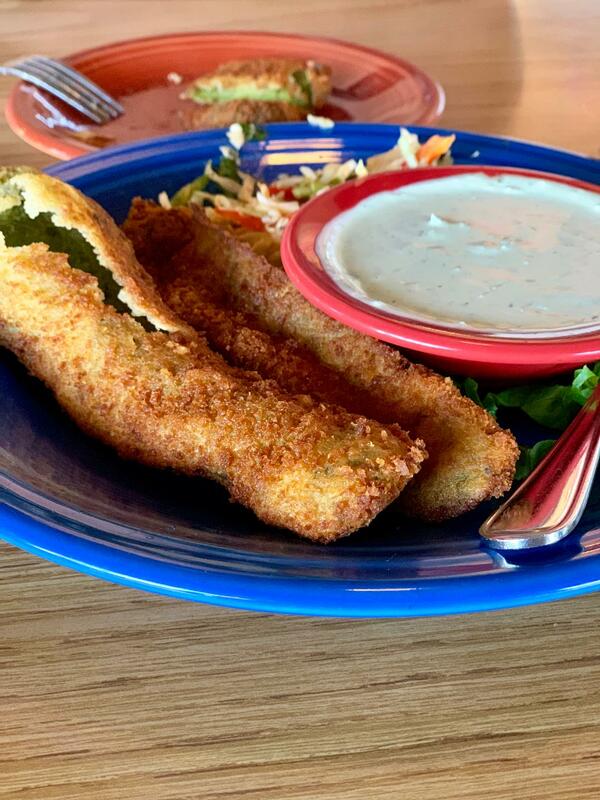 We started with the Green Chile Strips (breaded whole chiles served with cool creamy jalapeño dipping sauce...$5.99) as an appetizer. 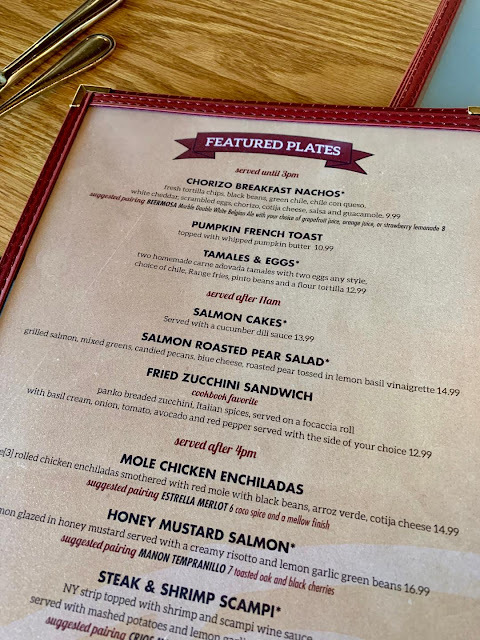 I'll eat anything with a green chile on it, and in New Mexico, I think it's the law that you have at least one if you're dining in the state. Green chiles are fairly big, so we went with the three-strip plate. Just the right amount. 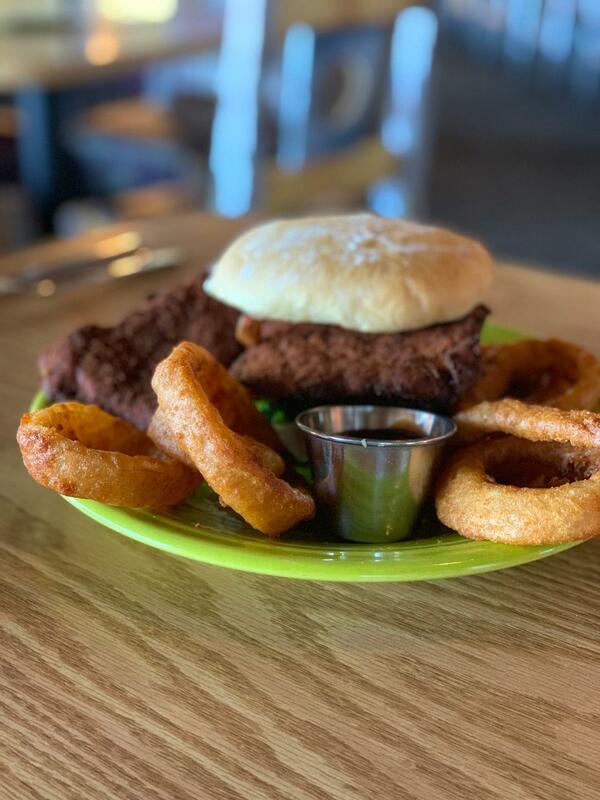 Ed had the Matt's Ultimate Hoosier (Parmesan breaded pork loin, topped with frizzled onions, housemade chipotle BBQ, lettuce, tomato & mayo on a toasted bun...$11.99) with a side of onion rings. I'm glad he got this because I was eyeballin' it and was happy to be able to have a taste. The pork loin was done perfectly. Crispy and juicy. I decided to have one of the featured plates - the Fried Zucchini Sandwich (panko breaded zucchini, Italian spices, served on a focaccia roll with basil cream, onion, tomato, avocado, and red pepper...$12.99) with a side of sweet potato fries. Apparently, it's one of their cookbook favorites. Ed and I shared our sandwiches, half to each of us. They were both delicious, but I looooooved mine. 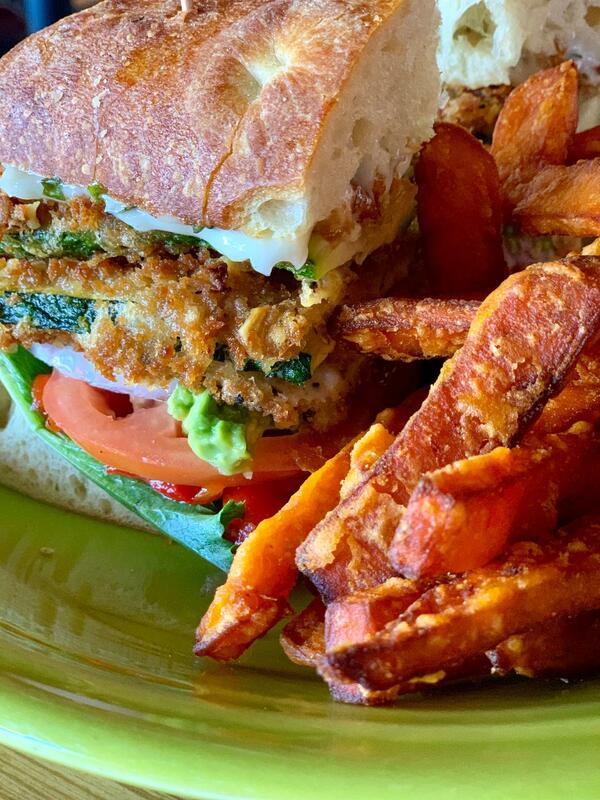 Let's look at its deliciousness up close. The zucchini was perfect. Lightly breaded and crisply fried, I would have never thought to pair that with lettuce and tomato let alone avocado. It was a good combination. And the fries were sweet little pieces of heaven. 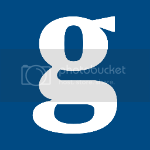 It's no wonder their motto is "Ordinary Food Done Extraordinarily Well." I also wanted to taste their Green Chile Tomato Jam, so I asked the waitress for a small ramekin. It was delicious. They sell jars of it for $4.99 to enjoy in the comfort of your own home. 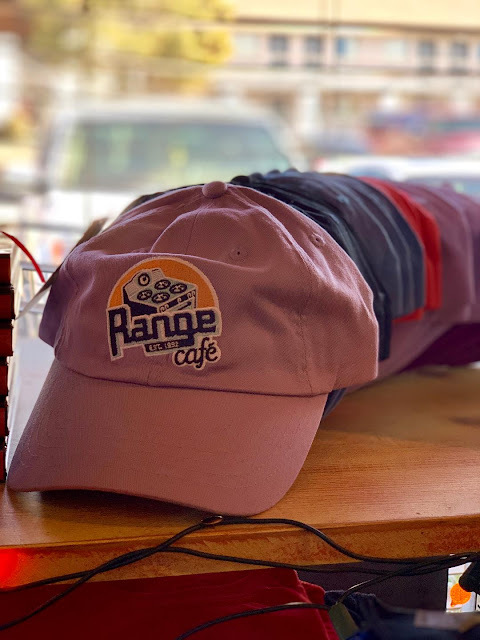 They sell hats, t-shirts, and a few other goodies at this location, but they have a full-blown gift shop at their Bernalillo, NM store, just 15 miles north of Albuquerque. We'll be back here for sure. There were several things on the menu I saw that I'd like to try and since we didn't have room for dessert on this visit, we decided we need to go back. Ed heard the pies were great and I'm itching to try Death By Lemon. Or their giant Cream Puff. Or the classic Carrot Cake. Or maybe my favorite, Vanilla Crème Brûlée. Wow! Vintage Daily Rant! I am so hungry now! Hey Don!! Hope you’re all doing well up there in my home state. I ❤️ NY! Always. Have a great Christmas! Hi Salena! 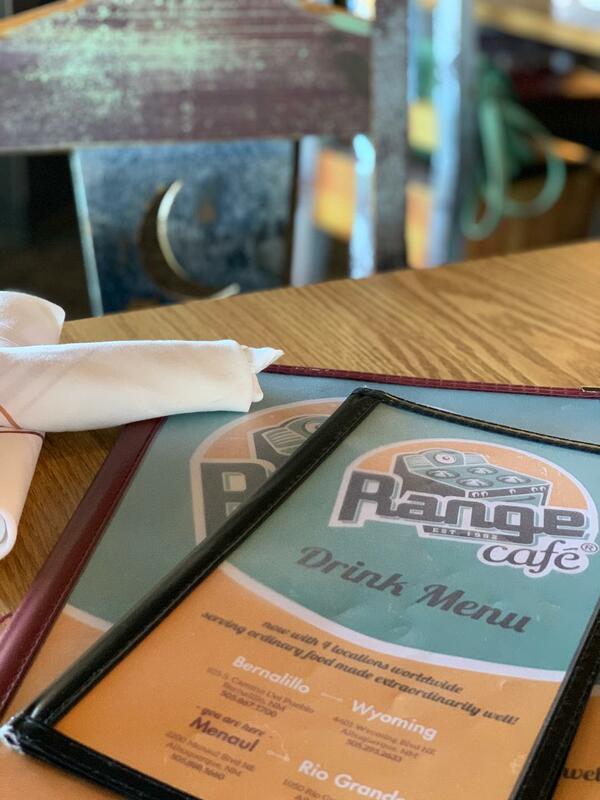 Great to see you enjoyed some NM green chile! And yes, you are correct, one must consume while visiting the state. I have not heard of this place and will definitely have to try on my next visit to Albuquerque. You definitely picked what I would have chosen - the zucchini! Was the green chile appetizer filled with cheese like a relleno? Hope you and Ed had a very Merry Christmas! Geez - sorry it's taken so long to respond to this comment! The zucchini was great, I'm considering making something like it at home. And the green chile appetizer was not filled with cheese (or anything), it was just breaded and fried, served with the sauce for dipping. Very delish! We had a good Christmas, hope you did as well. Have a fantastic 2019!